Exploring Bangkok involves a lot of walking, train rides, and river cruises. It’s easy to get around the city since their modes of transport are well-integrated with each other. Also, the sidewalks of Bangkok are usually wide which is great for exploring the city on foot. In the shopping districts, such as Ratchaprasong, there are skywalks similar to Ayala Center’s. Walking around the city with my two colleagues. One’s from IBM Malaysia and the other’s from IBM Korea. Walking on the skywalk. The skywalk’s below the tracks of the BTS Sukhumvit line. Given that I was in Bangkok for a training, my time to explore the city was limited. I only had one day where I was able to go around, and I had to cut my adventure short since I had to review the pre-work needed for the training. Erawan Shrine in the Ratchaprasong district. There were many worshipers in the place. One can also watch dance and musical performances there for free. Bangkok’s pretty popular for its street food scene. Sadly, I wasn’t able to try out much of it since I was looking at the wrong places. Apparently, there are sois or streets where one can find many street food vendors. I was able to sample some though. I’ll make sure that I’d try out more Thai street food the next time I visit Bangkok. As with other Southeast Asian capitals, Bangkok’s a city of malls. Whatever you’re looking for, the malls in Bangkok has got you covered. Their higher-end malls are just, wow. Siam Paragon, for example, has luxury automobiles on display including a Bentley. Of all the malls I went to in Bangkok, I enjoyed going around MBK the most. 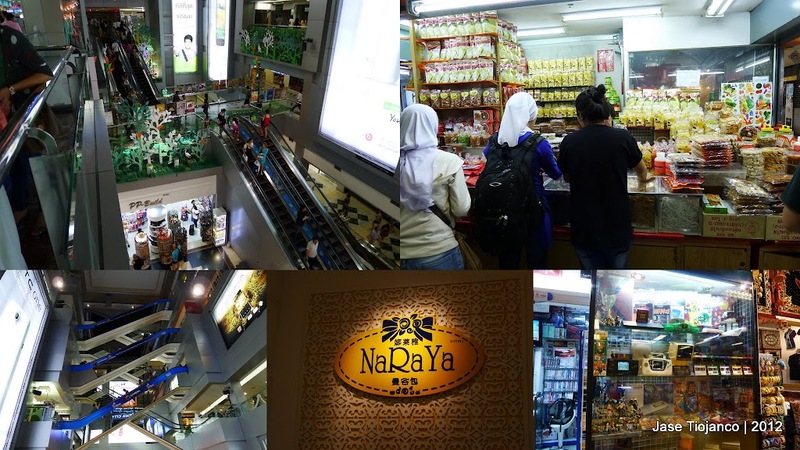 MBK is a huge shopping complex full of small stalls offering a wide array of goods. Think Greenhills Shopping Center, only bigger. MBK Shopping Complex. It’s easy to reach this place, just ride the BTS and head to the National Stadium station. There were many Thai goodies and snacks being sold in MBK. I bought some for my colleagues and friends. It was in MBK where I found the perfect Thai silk sleeping dress for my mom. Also, I was surprised to find a shop selling classic games. I almost bought some games for Sega Saturn. One of the reasons why riding the BTS is preferred in Bangkok is the fact that there are way too many cars in the city. I seriously don’t know who’d take the crown for the most congested capital in ASEAN — Bangkok, Jakarta, or Metro Manila. Speaking of the BTS, its fares cost much much more than our LRT/MRT’s… which in my opinion is a good thing. The lowest BTS fare costs 15 THB. Come on, how can you maintain a light rail system when your most expensive fare is just 15 PHP? No wonder our trains are encountering problems left and right. I’m pretty sure a lot of people will be against my opinion but I think it’s time for a fare increase. On our last day of training, the class ended pretty early. My new-found friends invited me to come with them to Healthland, a wellness center offering Thai massage. From the hotel, we rode the BTS to Asok and then walked our way to the establishment. Thank goodness BTS Stations have maps. Healthland Spa. They offer good massages at affordable prices. For 450 Thai Baht, one would get a two-hour Thai massage. The place was very clean and the ambiance was pretty nice. The three of us were assigned to a room and we were accompanied by the masseuses. The massage was really, really good and rejuvenating. For a person who doesn’t like massages, I actually enjoyed it. The masseuse assigned to me was very strong, good thing I know some Thai words. I told her nit noi, or little (pressure) only. After the massage, tea was served. One of the best things about Bangkok is its expansive skyline. There were times when I just stood at a BTS station and admired the buildings in the city. Bangkok’s a city that’s full of energy and life. I’d really like to come back and explore more of the Thai Capital. A far cry from Manila. I can’t help but feel a tinge of jealousy. I felt that tinge of jealousy as well. From the airport to the city-center, everything was better. Also, I like how they value their culture. Amid towering skyscrapers and speeding vehicles (or vehicles stuck in traffic), you’d still see traditional dances and music being performed in Buddhist shrines. That road pic looks like in Makati/EDSA. Hahaha! Oh that dumpling looks so good =.=. And their mangoes are preserved with ice, unlike here. Yeah, that crossed my mind when I was taking the photo. It looks like EDSA and one of the MRT stations along it. will bookmark healthland for the thai massage! the price is super affordable. nakakamiss talaga ang bangkok.lalo na ang spicy food namura lang.